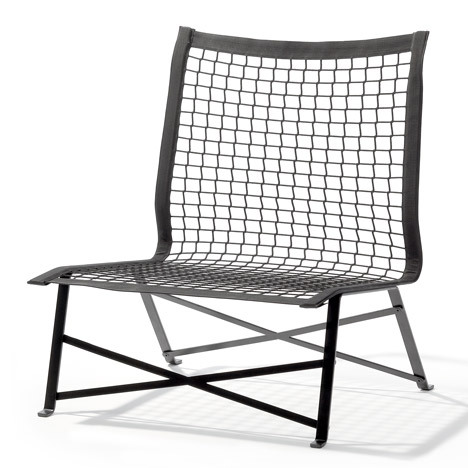 Cologne 2012: Dutch designer Bertjan Pot showed this chair made of a tennis net at imm cologne last week. The use of netting creates a flexible seat that can be left outside, as opposed to rigid garden furniture that requires a cushion brought from indoors. The wide holes should mean it dries off quickly after a shower of rain too. Called Tie-break, the piece is manufactured by German brand Richard Lampert. See all our stories about Bertjan Pot here and all our stories about Cologne 2012 here. Photos are by Richard Becker. There are not that many soft-skin outdoor chairs. Mostly you bring a pillow outside to sit down into your garden furniture and then take it back inside when it starts to rain. In the net we saw the possibility to make a soft (comfortable) outdoor-chair. Our advice: Put on a T-shirt, a pair of flip-flops and give your suit and tie a break. Off course ‘Tiebreak’ can be used indoors as well.